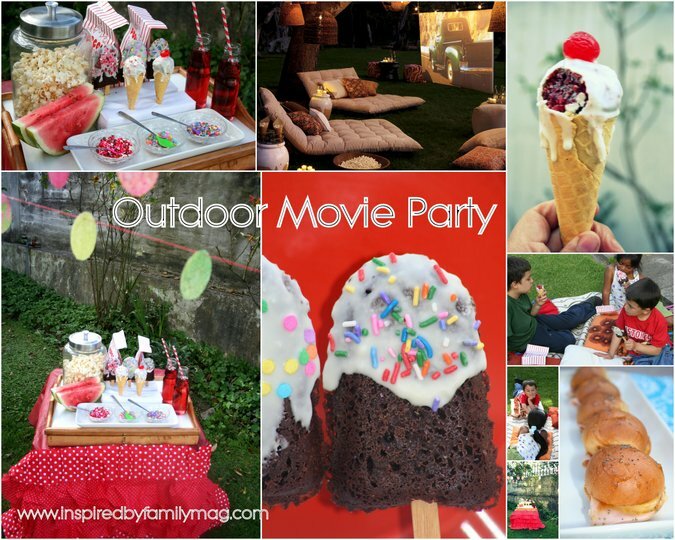 Going with our Simple Summer theme I will share with you our Movie Under the Stars party! This is one of my favorite Summer activities and our boys can’t wait for us to host another one because it entails all of their favorite things: yummy dessert, friends, movies and being outdoors! 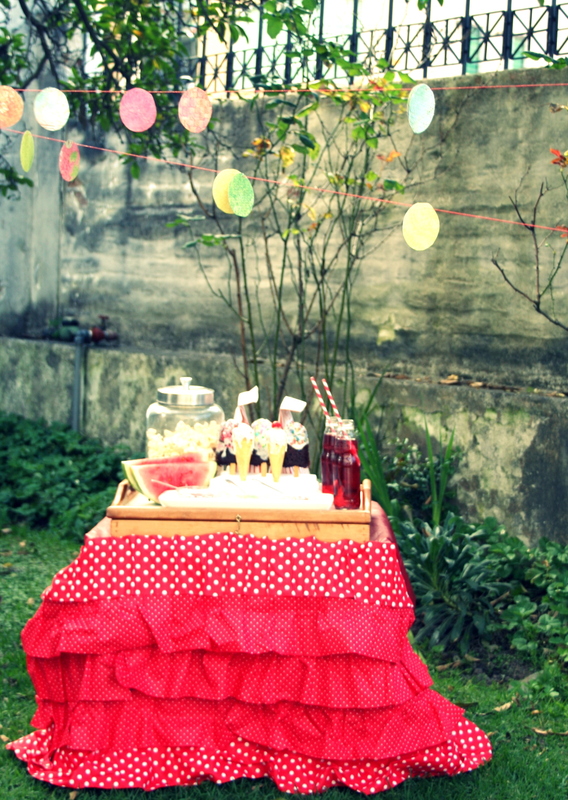 Why not host one for July 4th or kick off the summer with a simple family outdoor movie night? 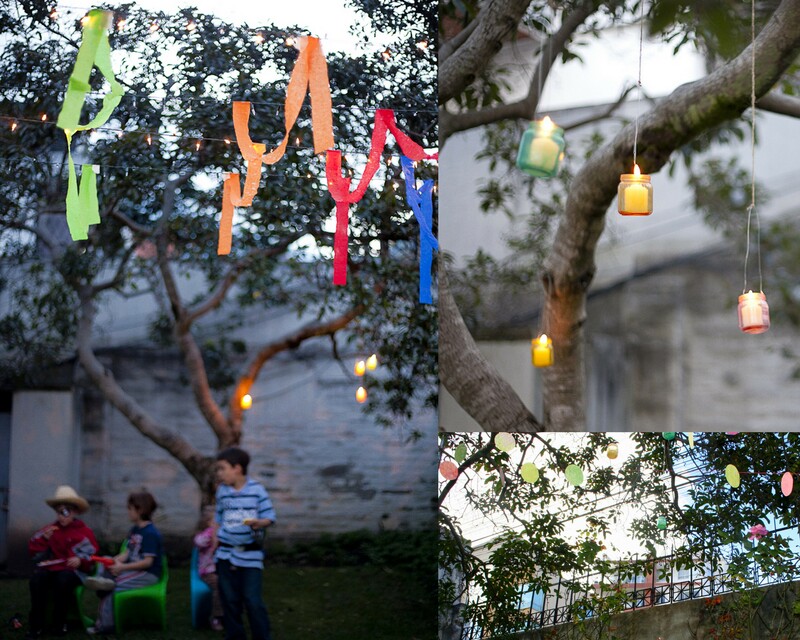 You can decorate your outdoor area with Confetti Bunting, streamers or you can hang some diy Dyed Jar Luminaries the how to can be found in our Free online flip-page digital magazine . Hello new reader/friend! Are you enjoying our fun post? We would love to have you follow along via your favorite social network :Twitter,Pinterest or Facebook and our readers preferred way via email. The table was covered with a fun No-Sew Ruffled Tablecloth and we layed blankets, pillows out on the grassy knoll. Our kids enjoyed the treats and frolicked while we got ready. The treats: watermelon, candied popcorn, frosted cake in a cone, ham and cheese sliders and popsicle brownies. Ham and cheese sliders are great because they are so easy, especially if you purchase the dinner rolls. 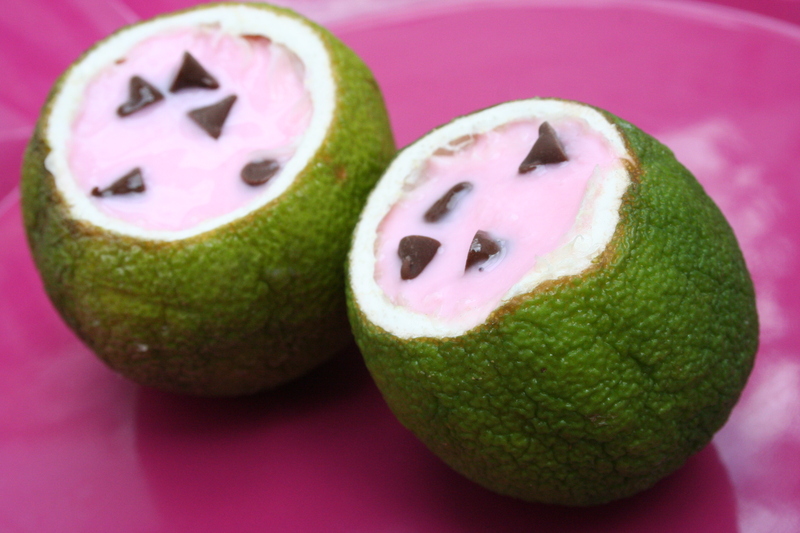 Another fun cool and healthy treat is frozen yogurt in limes to give it a faux watermelon look! Recipes can be found in our digital Simple Summer Issue! The fun box cars I shared over on Kid Activities Blog my boys had so much fun with the cars. For the adults add some Prosecco and Popsicles to the cool summer treat! Make sure you have extension cords. The first time we hosted one we forgot them. Thankfully the neighbors helped us out on that one. It will be dark or almost dark so either set it up before hand or have lanterns, lighting, dyed jar luminaries…. Scope out your area ahead of time making sure you know how far your electric outlets are, if you have a wall or need to make your own movie screen, is there grass, is the ground wet…. Speakers. Though your laptop probably has built-in speakers it most likely won’t be loud enough. Ours doesn’t get very loud and then you add outdoor noise to it and it makes it very hard to hear. You need some basic speakers to attach to your laptop. The first time we used a projector we didn’t have speakers so everyone had to be very quiet and be near the laptop to hear the movie. We shared faux Cool Treats: Frosted Cake Ice Cream Cones, Brownie Popsicles so we didn’t have to deal with them melting. So much easier and tasty too. Pottery Barn shares an easy screen how to if you don’t have a wall to project the movie on. Stop by and check out our Summer Fun Pinterest Board for more ideas! What a great party idea! Love it! Thanks for sharing with us at our Pinteresting Party. Hope you will come back and share again this week. I have always wanted to host an outdoor movie night. This looks so much fun and amazing. Thank you for sharing these awesome plans and recipes at Freedom Fridays. Howdy, I do believe your web site could possibly be having web browser compatibility problems.